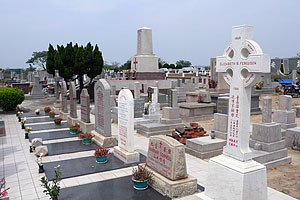 The Tongpanqian Cemetery is vast and contains some of Taiwans most historic graves. Tainan holds much of Taiwan’s oldest history, and it should therefore surprise non that it also holds one of the most historic cemeteries. The Tongpanqian Cemetery in the south district of Tainan is the city’s largest and contains many notable graves. These include the oldest Ming dynasty grave, the tombs of two of Zheng Chenggong’s concubines and two of his sons, and the final resting place of early Presbyterian missionaries such as Reverend Thomas Barclay. 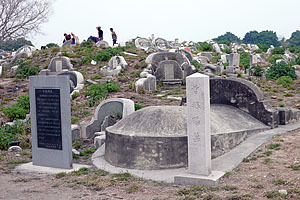 While graveyard tourism is not popular for many Taiwanese, some of these historic tombs have been marked by the government as national historic sites. The Tongpanqian Cemetery is quite vast. The bulk of it is enclosed by Zhonghua South Road to the south, Ximen Road to the West, Dacheng Road to the north, and Guomin Road to the east, but some areas of the cemetery extend beyond these borders. The southern side has clear access and has small roads winding through it, but in the northern side the vines and weeds grow thick in several areas and it is difficult to traverse. Luckily, the more historic tombs are in the clearer areas and can be accessed by Zhonghua South Road or Ximen Road. The oldest Ming dynasty tomb, that of Ceng Chen Yang, is marked by a stele that gives information in English and Chinese. The tomb of Ceng Chen Yang (曾振暘墓) is the oldest known Ming dynasty tomb in Taiwan and is probably the easiest of the historic tombs to find. The tomb dates from 1642, nearly twenty years before Zheng Chenggong took the island from the Dutch. The tomb was discovered by archivists in 1952. It is of moderate size and decoration and is clearly marked by a stele giving information in both Chinese and English. To find this tomb, head north on Ximen Road from Zhonghua South Road. After about 100 meters, look for a stone plaque with an arrow and the characters “曾振暘墓.” The tomb is a stone’s throw from the fence along Ximen Road. During the Qing dynasty, most of the tombs for Ming loyalists were moved back to the mainland for political reasons. You will not find the remains of Zheng Chengong, Zheng Jing, or any other significant figure of the Zheng period in Taiwan. Most of the family members of the Zhengs were also removed. The exceptions are the tombs of two of Zheng Chenggong’s concubines and two of his sons which can be found in Tongpanqian Cemetery. These tombs are the only remaining graves of the Zheng family from the reign of the King of Yenping (1662 to 1683). The tomb of Lady Ceng and Lady Cai (藩府曾蔡二姬墓) was allowed to stay on Taiwan because these two concubines had not produced offspring. They were two of Zheng Chenggong’s six concubines. They share a modestly decorated grave similar in size and style to Ceng Chen Yang. To find this site, follow Zhonghua South Road from the east. After passing the tunnel, take the first right. Go along the small road and then find the first left (west). There is a path here that can be traversed by foot or motorcycle. Follow the path for about fifty meters and then look for a stone plaque marked with “藩府曾蔡二姬墓”. Follow the direction of the arrow past several graves. About twenty meter from the arrow you’ll see the tomb marked by a large stele that gives information in Chinese and English. According to the government website, remains of Zheng Chengong’s fourth and tenth sons (藩府二鄭公子墓) are also interned in this cemetery. So far, I’ve not been able to locate any markers for their graves. On the path leading to the tomb of Lady Ceng and Lady Cai, there is a stele marking the grave of a Qing dynasty family that were notable for academic and civil service success. The tomb dates from 1877, and is quite unique and well-maintained. The tombs of 8 Christian missionaries are all in a row in the Chrsitian section of the cemetery. Other notable graves include those of foreign Presbyterian missionaries who died while serving on the island. There are eight tombstones in total, all in a row, marking the final resting places of Elizabeth Ferguson, Hannah Connell, William Thow, Gavin Russell, Marjorie Amy Brooking, Jane Anne Lloyd, Margaret Barnett, and the distinguished Thomas Barclay. Barclay is of particular importance to Taiwan’s history and is commemorated by the Barclay Memorial Park, the Barclay Memorial Church, and Tainan Theological College and Seminary. All these missionaries died between the 1880s and 1930s. These tombs have not been marked by the government, but the inscriptions are in English. To find these graves, follow Zhonghua South Road from the east. After passing the tunnel, take the first right into the cemetery. Take another right (east) down a smaller road and follow it toward the crosses of the Christian section of the cemetery. Towards the eastern part of the Christian section you will see a large monument covered in white tile. The tombstones of the eight missionaries are near the foot of this monument. Plaques like this one show the way to historic graves. The Ming dynasty tombs are marked for tourism, but may not attract much attention form tourists. In many Western countries, visiting tombs of historic figures is a large part of tourism and cemeteries can almost feel like gardens or parks. In Taiwan, however, such recreational activities seem quite apart from an appropriate cemetery visit. Cemeteries are not places for leisurely strolls, and they are often only visited during Tomb Sweeping Day or when proper attention can be paid to the grave site. This is not to say you cannot visit the cemeteries in Taiwan. You are free to visit and wander through a cemetery as long as you don’t disturb the solemnity of the place. You may find your Taiwanese friends reluctant to accompany you, however. There are many superstitions surrounding cemeteries, and no one wants to risk any negative attention from the ghosts. Hello, I came across your article and am interested in visiting the cemetery when I visit Tainan, however I can’t find it on google maps. May I know how you got to the cemetery? Thank you! The google map included in the article should work. If not, the easiest way to find the cemetery is to head south on Ximen (Simen, 西門) Road until it ends at Zhonghua South Road.